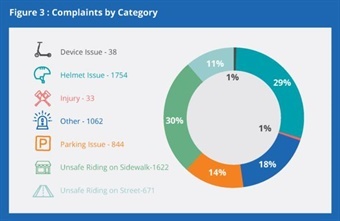 New data gathered by Multnomah County Health Department for PBOT show e-scooters were subject to risks similar to other ways of getting around. Drawing on scooter use data, public opinion polling, staff observations, and other sources, the Portland Bureau of Transportation released the 2018 E-Scooter Findings Report. The report evaluates Portland’s first e-scooter pilot conducted from July 23 to Nov. 30. Based on this evaluation, the bureau also announced a one-year pilot program that will bring e-scooters back to Portland streets this spring. New data gathered by Multnomah County Health Department for PBOT show e-scooters were subject to risks similar to other ways of getting around. Scooter-related injuries, including injuries from non-motorized scooters, were a small portion of total traffic crash injuries, accounting for about 5% of the estimated 3,220 of total traffic crash injury visits to emergency rooms and urgent care centers during the pilot period. Scooters generated 176 visits or less than one-half the 429 visits for bicycle-related injuries. 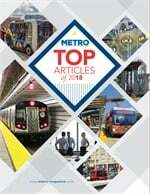 “We recognize people are interested in understanding the risk associated with a citywide scooter ride-share program, and this analysis provides an important baseline from which to make that determination," said Environmental Health Director Jae Douglas, Ph.D. "After reviewing emergency department and urgent care clinic data, we found that e-scooters have risks similar to other parts of the transportation system. We did not find a disproportionate risk that would discourage the city from allowing a scooter ride-share pilot." A start date for the second pilot program has not been set. PBOT staff will brief community groups and transportation advisory committees on the findings report and seek input on how the bureau should conduct the second pilot program. A longer one-year pilot program will give PBOT the chance to test new measures to improve the use of e-scooters. A majority of Portlanders viewed e-scooters positively. In a representative citywide poll conducted in December by DHM Research, 62% of all Portlanders viewed e-scooters positively at the end of the pilot. Support was even higher among Portlanders under 35 (71%), people of color (74%), and those with incomes below $30,000 (66%). Scooter safety risks were similar to other ways of getting around. According to the Multnomah County Health Department, scooter related injuries increased from less than one per week before the pilot to about 10 per week during the pilot. Weekly emergency room visits peaked in late August and early September before decreasing to near pre-pilot levels by the end of the pilot in November. Portlanders primarily used e-scooters for transportation. Seventy-one percent of Portlanders reported that they most frequently used e-scooters to get to a destination, while only a third of respondents (28.6%) said they most frequently used e-scooters for recreation or exercise. E-scooters replaced driving and ride-hailing trips. Thirty-four percent of Portland riders and 48% of visitors took an e-scooter instead of driving a personal car or using Uber, Lyft, or a taxi. Having safe scooter infrastructure mattered to riders. Based on scooter ride data, riders preferred riding on low-traffic streets such as neighborhood greenways and on streets with bike lanes. This was also confirmed by rider survey data. Portlanders reported widespread illegal sidewalk riding and incorrect scooter parking. With speeds capped at 15 miles per hour, scooters are appropriate for bike lanes or low-volume streets, but they are too fast for use on sidewalks, where they make it unsafe or uncomfortable for people walking or using mobility devices. 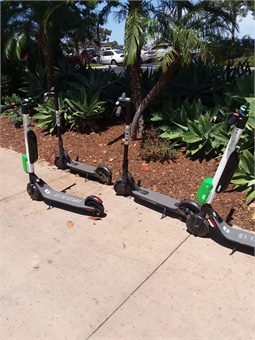 And while staff observations showed most scooters parked properly in the sidewalk furnishing zone, improperly parked scooters negatively impacted accessibility and created a hazard for people with visual impairments. E-scooter use in parks impacted other users and presented a significant management challenge for Portland Parks & Recreation staff. Although bicycles are allowed in Portland parks, including Waterfront Park and the Eastbank Esplanade, motorized vehicles are not. E-scooter use on Portland parks trails violated Portland Parks & Recreation’s rules, but most riders (66%) said they weren’t aware of the rules. E-scooter companies did not consistently comply with the East Portland fleet requirement and the pilot program showed other equity challenges. 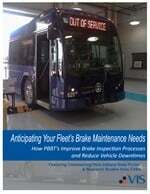 Companies did not consistently comply with the East Portland fleet requirement. Companies only enrolled 43 Portlanders in a low-income plan. Along with staff observations, this suggests low company performance in aligning business practices with city equity goals.